Orangeburg pipe is comprised of loose wood pulp and tar which is pressed and formed into a pipe shape. Due to its low price and simple manufacturing process, Orangeburg was quite popular in construction from the 1860s through the 1970s. Orangeburg was used in some areas as experimental water supply pipe, however, its widespread use was predominantly stopped with the widespread adoption of the wastewater sewer pipe. Although Orangeburg pipe is resistant to corrosion and other damaging natural degradation, it is more likely to fracture break and bend. Orangeburg pipe is no longer used in new constructions for its flaws, and is against the International Plumbing Code (IPC). Tree root damage is the most common cause of fractures and breaks forming in Orangeburg piping. Because Orangeburg is a much more pliable material, a tree roots natural growth will compress bend and even break an Orangeburg pipe. When this occurs you can experience sewage leakages and backups in your home. Chemical corrosion is another leading cause of rapid degeneration and failure. When chemicals are improperly disposed and flushed down the drain they will eat away at the interior of the Orangeburg pipe. The bitumen cement used to form the Orangeburg pipe will stand up to moisture, but it does react to harsh chemicals like drain cleaner, other oils, polymers, and some household cleaners. Shifting ground either from natural settling or the addition of new infrastructure or weight onto the soil can cause the Orangeburg pipe to collapse. Under uneven pressure and from naturally degrading over time, the Orangeburg pipe will begin to lose its original shape. If your home was constructed after 1973 then you do not have to worry about Orangeburg pipe being used in its construction. It can be difficult to spot Orangeburg pipe because the majority of the pipe is buried underground. Some city planning departments will keep track of homes with Orangeburg pipe and can give you a better clue if Orangeburg was used in your homes building development. If you are unsure if your home has Orangeburg pipe, seek the help of a professional plumber. Greenwave Plumbing offers professional plumbing testing and repair services that will pinpoint any issues. Before a replacement project begins, a thorough test and scan is administered to determine the path of the Orangeburg pipe and what state it is in. A small camera attached to a drain sake is pushed through the pipe to check for breaks, fractures, and cave-ins. The drain snake is then tracked by a technician with a tracking unit that determines the path of the Orangeburg pipe, and its connections to your home and the main city sewer line. Orangeburg was replaced in the late 1970s with PVC pipe which was found to be more resilient to strain and pressure. The PVC pipe used today is strong, cheap, and resilient to many of the corrosive chemicals and conditions that caused Orangeburg pipe to fail. 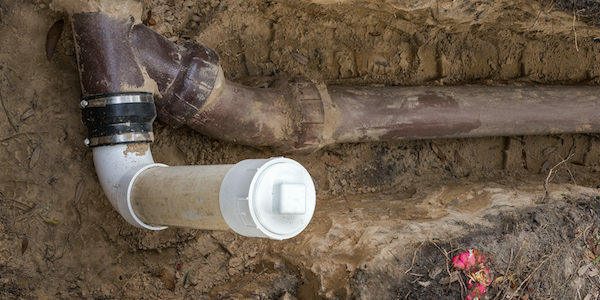 Orangeburg replacement can be an unfortunately large project, however it depends entirely on the layout of your home, and how your wastewater is connected to the main city sewer pipe. If you are experiencing plumbing issues with your home, whether it be plumbing leaks, sewage pipe clogs or breaks, Greenwave Plumbing is here to help. Learn more about our plumbing services or contact Greenwave Plumbing today!